Premier Houseboats are pleased to present Grand Hustler, a trawler which has been converted to a surprisingly spacious houseboat, that has also had its wooden hull well maintained and has only recently come out of dry dock. Grand Hustler has been thoughtfully converted to provide good living space, without having any negative affect on her ability to cruise. 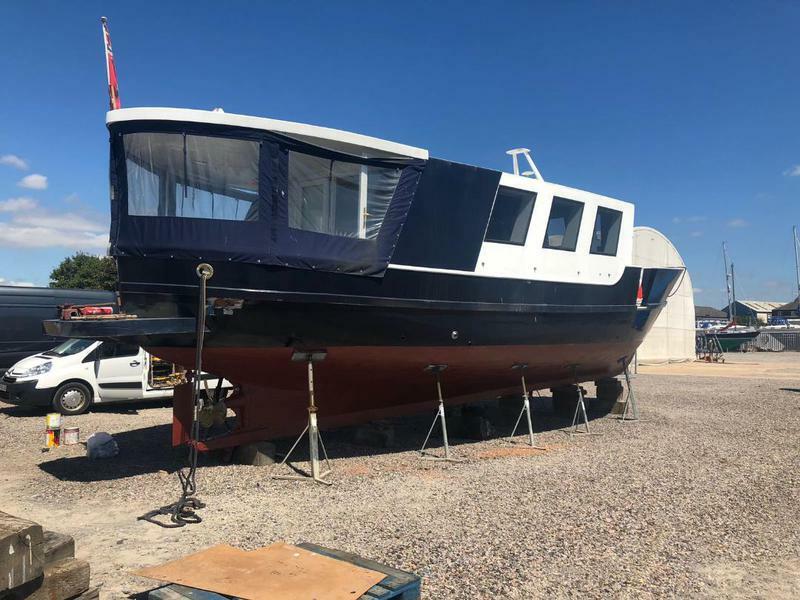 Accommodation is on two levels, and includes a large double cabin with storage throughout, a second double berth, and a good sized saloon area with french doors leading to a covered outside area. This saloon also boast a projector and pull down screen. There is a good sized galley which includes a built in fridge and dish washer, and a shower room with modern double shower unit, sea toilet and hand basin. There are electric radiators throughout the boat, and hot and cold water. The boat has Celotex insulation throughout. The boat has been recently dry docked, all work needed to the hull was carried out, and then the boat was painted and had new anodes fitted. Other work carried out included a new starter motor and starter battery, two new leisure batteries, and new bilge pumps. There is also a new water pump, accumulator tank and fresh water tank. Grand Hustler offers a wonderful, life changing and rare opportunity to live afloat in the South West, with mooring fees of only £300 per month. Given her high level of maintenance and fit out, and her location, she offers excellent value. Vessel name: Grand Hustler Vessel condition: Good Year constructed: 1956 Year refitted: 2018 Berths: 4 Cabins: 2 Heads: 1 No. of engines: 1 Engine model: Leyland Engine power: 200 Fuel type: Diesel Drive type: Shaft drive Length over all: 48' Beam: 13' Maximum draft: 4' Hull material: Wood Hull type: Other Disclaimer Premier Houseboats offers the details of this advert in good faith as it was presented by the seller or his representative but cannot guarantee or warrant the accuracy of this information nor warrant the condition of the described item within this advert. A buyer should instruct his agents, or his surveyors, to investigate such details as the buyer desires validated. The Item described within this advert is offered subject to prior sale, price change, or withdrawal without notice.